ECL has six test cells and distinct auxiliary rooms for control systems and analytical equipment on the ground floor. Three of the test cells are dedicated for engine research including large-engine test facilities. 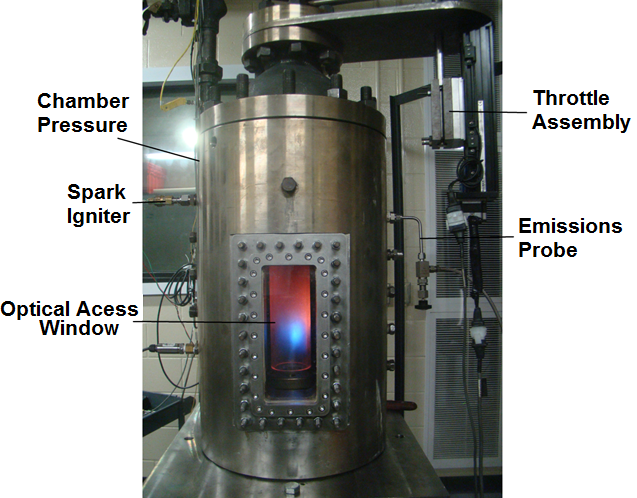 The remaining three test cells are dedicated to fundamental and applied combustion research. Figure on the right illustrates a cutaway view of the ECL space including three test cells on one side of the lab. Support infrastructure in the ECL includes water, conditioned combustion air, compressed air (up to 200 psig), and electrical supplies of adequate capacity to properly conduct engine and combustion testing. 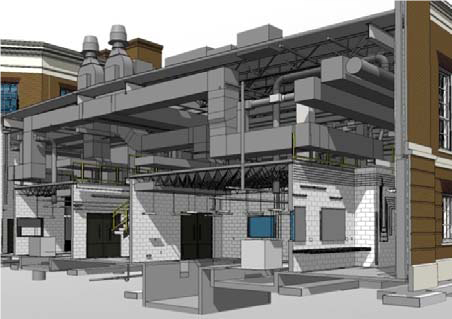 Each test cell has dedicated exhaust systems for experimentation, as well as safety systems for protection against fire and toxic-gas release. ​Existing fuel tankage/plumbing supplies all test cells with gasoline, diesel and alcohol-blend fuels; accommodations can be made for additional fuels as well. ECL has access to a small two-room machine shop for simple fabrication or modification jobs. There is a second-level mezzanine, which is primarily for storage and auxiliary equipment. One large test cell houses a two-roller chassis dynamometer capable of measuring power output of front, rear, or four-wheel-drive vehicles up to 14,000 pounds gross vehicle weight and up to 350 hp per axle. The other large test cell houses an AC engine dynamometer rated at 650 hp and up to 1360 ft-lbf torque. a dilution tunnel and five-gas emissions analyzers for raw and diluted samples, plus particulates, capable of handling the exhaust of a 650 hp diesel engine at full load. TSI Volumetric 3-component Velocimetry (V3V) system for 3D velocity-field measurements. high-speed TSI Planar Laser-Induced Fluorescence (PLIF) system for time-resolved combustion species measurements. Phase-Doppler Particle Analyzer (PDPA) system for point measurements of drop size/velocity. Koehler Instruments K45000 distillation analyzer, and a gas chromatograph system for product-gas analysis. This optically accessible high-pressure chamber allows combustion experiments at realistic test conditions for gas turbines and industrial burners. A dedicated compressed air facility is used to supply air at pressures up to 200 psi. Experiments can be conducted at chamber pressures of up to 10 atm. A 70 kWe electric heater is used to preheat air to temperatures up to 1000 F. The chamber pressure can be operated with liquid or gaseous fuels. ​The combustor is enclosed within the stainless-steel pressure chamber with two parallel rectangular optical widows (10 cm x 30 cm) and a sonic nozzle to control the operating pressure. Chamber pressure is regulated by varying the throat area of the nozzle by traversing of a tapered needle at the exit of the chamber. A remotely controlled motor driven slide assembly is used to control the motion of the tapered needle. A Sierra Smart Track 2 Series 100 mass flow controller is used to measure and control the gaseous fuel. A high pressure Eldex Optos Model-3 liquid fuel pump is used to supply the liquid fuel. Laminar flow elements are used to measure the air flow rates. Access ports on the test chamber are used for pressure, temperature, and species measurement. . The swirl-stabilized, lean premixed combustor is used to simulate gas turbine combustion at atmospheric pressure. In the experiments, reactants flow from bottom to top. Combustion air is compressed and dried prior to being introduced into the system through an air plenum filled with marbles to homogenize the air flow before methane is introduced through a multi-hole annular injector. A critical flow venturi is placed downstream of the fuel injector to create an acoustic boundary, thereby preventing pressure oscillations in the mixing tube and combustor from traveling upstream into the methane or combustion air supply lines. The methane-air mixture travels through a mixing tube and then enters the circular quartz cylindrical combustor via a swirler. 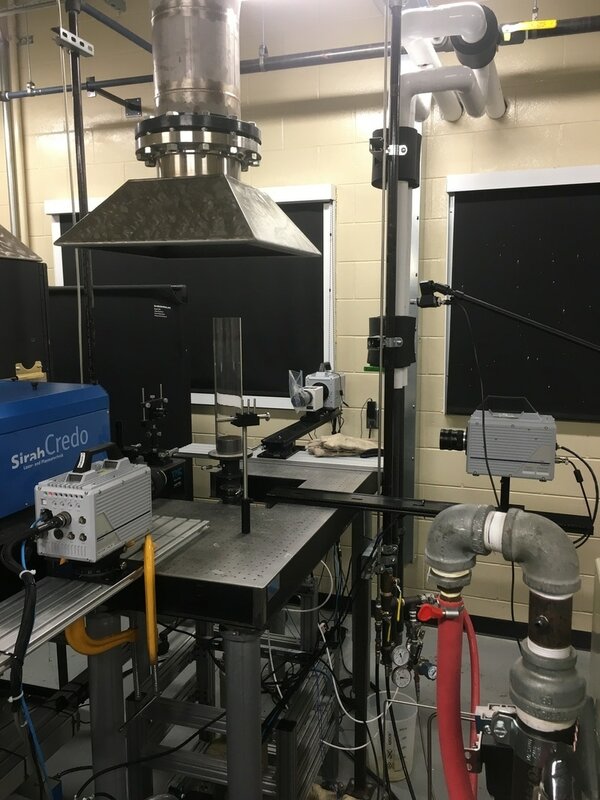 Facility is used to study control of thermo-acoustic instabilities using a passive mitigation technique, developed by our group. It employs a porous, annular shaped, ceramic ring that is placed on the dump plane. The porous insert utilizes two core mechanisms (a) reduce the acoustic power generated by the combustion process, and (b) minimize the coupling between flame front and vortical structure . First, the geometric alteration to the combustor dump plane by the porous insert eliminates the corner recirculation zone and displaces the central recirculation zone farther downstream and away from the flame front. Second, the pores allow some (approximately 10 to 15 %) of the reactants to flow inside the porous matrix. These reactants exit the porous insert on the downstream face and combust, leading to the formation of a ring of small flames (flamelets) surrounding the core flame in the core of the porous insert. The flamelets act as “pilot flame” to anchor the core flame in lieu of the corner recirculation or central recirculation zones with vortical structures that can couple with the reaction zone. Flamelets also aid in the shedding of any unwanted flow features downstream from the reaction zone by eliminating the need for the vortical structures to stabilize the flame. Time-resolved particle image velocimetry (PIV) technique is available for velocity measurements. Quantronix Hawk-Duo 532-120-M Nd:YAG laser with wavelength of 532 nm at repetition rate up to 25 kHz can be used for the experiments. The time between the two laser pulses can be adjusted to suit the need of the experiment. TSI divergent sheet optic, with f = -25 mm cylindrical lens, combined with a 500 mm spherical lens is used to create 1 mm thick laser sheet. Photron SA5 Fastcam camera with Sigma 105 mm focal length lens is used at framing rates of up to 50 kHz to image the field of view of about 65 mm by 70 mm. For stereoscopic PIV measurements, the field of view will be imaged simultaneously by two cameras oriented at different angles. The angle between the cameras will be determined to maximize the measurement accuracy for a given experiment. 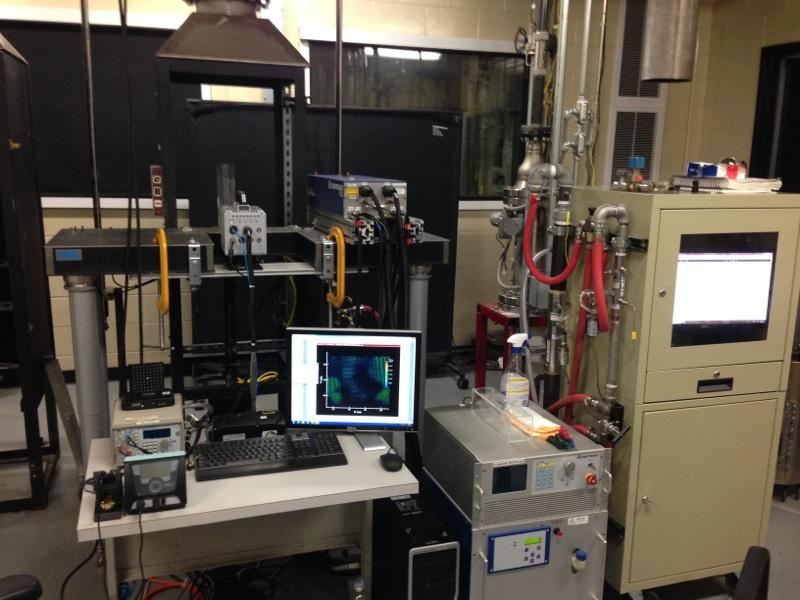 Time-resolved PLIF system uses laser induced fluorescence imaging to produce 2-D images of combustion species concentration. Output from a high-repetition rate dye laser is formed into a sheet, illuminating the flow region of interest. The output wavelength of the laser is tuned to be resonant with an optical transition of the desired species. At this wavelength, a fraction of incident light is absorbed by the species and subsequently re-emitted with a modified spectral distribution. This emitted fluorescence signal light is collected using a UV-lens and species-specific bandpass filter and imaged using a high-speed intensifier and camera system. The high-repetition rate dye laser, pumped by a diode-pumped Nd:YAG, is tunable between 273-375nm output wavelength. This allows for the access of OH transitions near 283nm and CH transitions near 365nm. A large scale combustor facility is used to experiment with industrial burner systems. Compressed air is dehumidified and split into primary air supply and atomizing air supply lines. Natural-gas, used to start the combustor, is supplied from high pressure storage cylinders. A peristaltic pump is used to supply liquid fuel. Laminar flow elements are used to measure the primary-air and natural-gas flow rates. The atomizing-air flow rate is measured and controlled by a Smart Track 2 Series 100 mass flow controller. Combustion products are sampled continuously by a quartz probe mounted on a manual traversing system. A Nova gas Analyzer with uncertainty of 2 ppm is used to measure concentrations of CO and NOx in the dry exhaust gas sample. The analyzer also measures O2 and CO2 concentrations, used to verify the equivalence ratio computed from the measured flow rates.